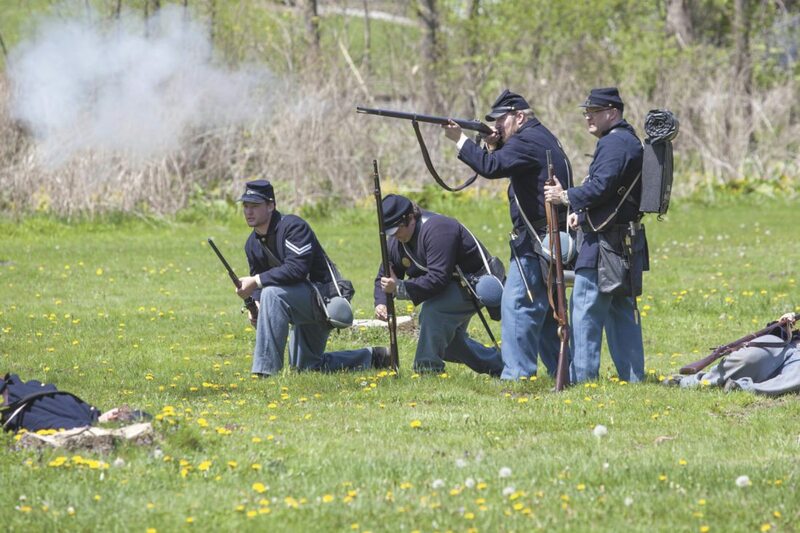 Civil War re-enactors portraying Union soldiers open fire on advancing Confederates at Kish Park in 2013. 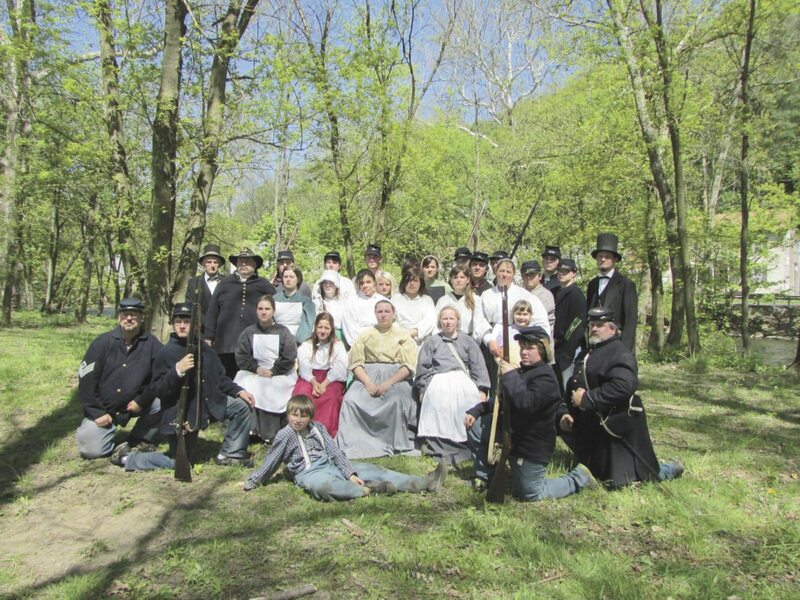 Similar skirmishes are scheduled during the ‘Sparks in the Park’ Civil War event to be held May 4 to 6. Civil War re-enactors portraying Union soldiers charge toward advancing Confederates at Kish Park in 2013. Somerset resident Ralph Lincoln, center, portrays his ancestor, President Abraham Lincoln, delivering the Gettysburg Address while flanked by Union soldiers at Kish Park in 2013. 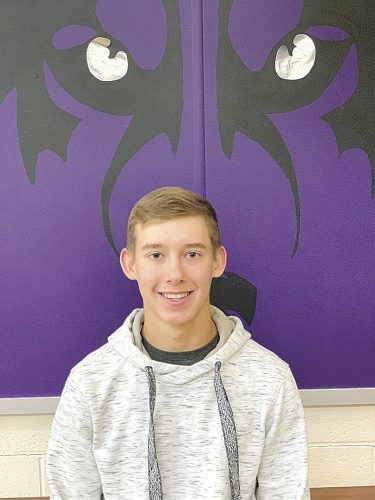 Lincoln is slated to be a featured speaker again during ‘Sparks in the Park’ on May 6. 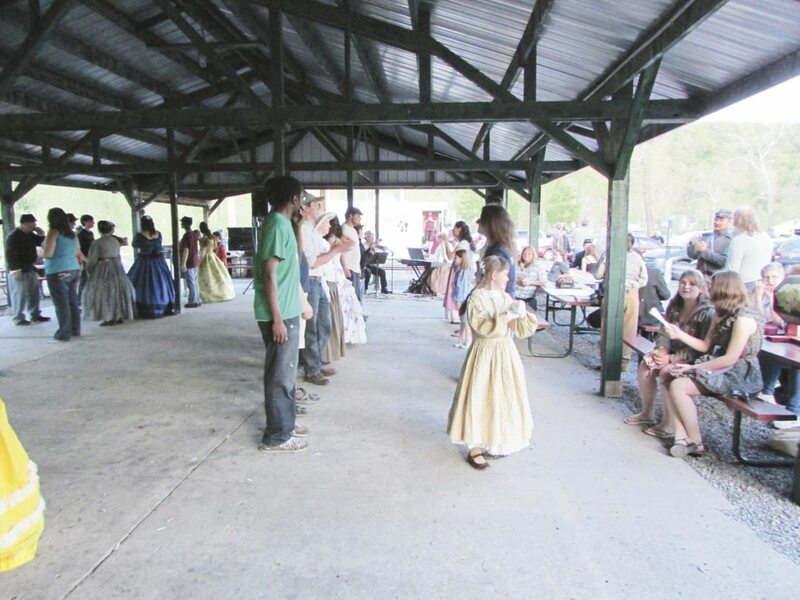 Re-enactors and area residents mingle during a Civil War-era ball dance at Kish Park in 2013. A similar dance is scheduled on May 5 as part of the ‘Sparks in the Park’ Civil War event. 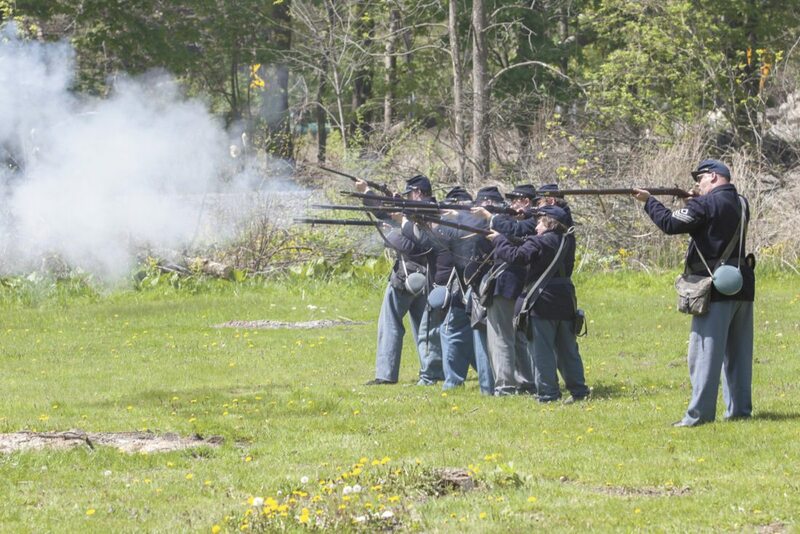 Civil War re-enactors portraying Union soldiers open fire on advancing Confederates at Kish Park in 2013. 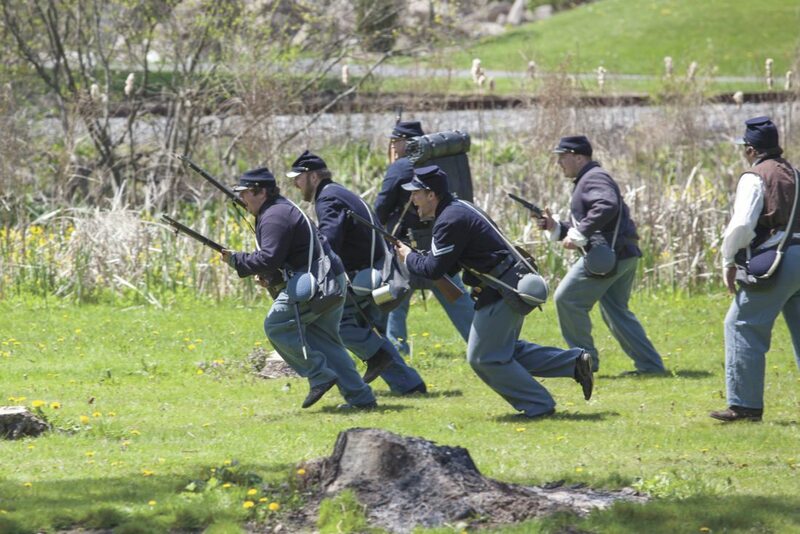 Similar skirmishes are scheduled during the 'Sparks in the Park' Civil War event to be held May 4 to 6. When I was a young fifth grader at East Derry Elementary (1975), Mr. McClenahen tried very hard to teach us about the American Civil War. We went to Gettysburg and toured all the battlefields, sat through the electric map presentation, walked up the rotunda and looked at the murals and visited the gift shop. Honestly, I don’t remember much of that day now. I do remember thinking, “This is boy stuff. Why should I care about battles and guns and cannons? Yeah, they are neat to look at, but I don’t want to fight.” Even knowing there were ladies who dressed as men and signed up to be soldiers until they were discovered wasn’t all that interesting to me. Fast forward to 2009: My oldest son, Zachary, received a pamphlet from a friend about Civil War re-enacting. 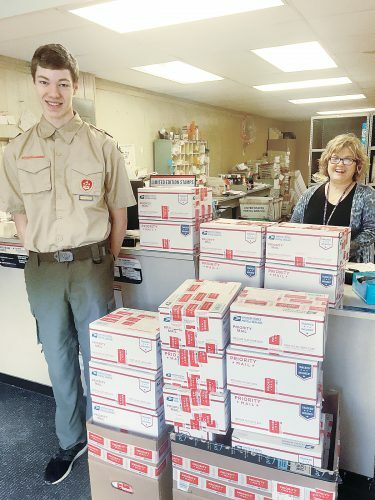 There was a new Boy Scout Venture Crew starting in the area that was focusing on teaching, training and portraying soldiers, medical staff and army followers of the time from 1861 to 1865. He wanted to join. Zachary loves to learn about history. 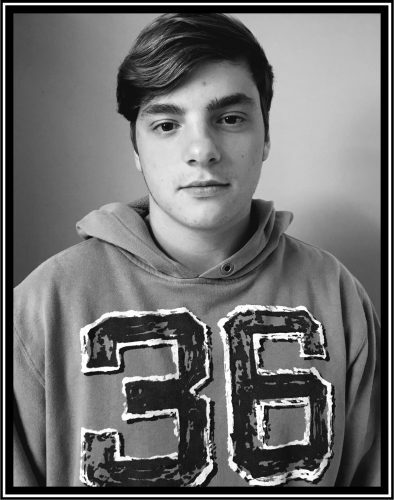 Ever since his own school trip to Gettysburg in fifth grade he has read lots of books and accounts of the Civil War. This would be his chance to “relive” that time period. 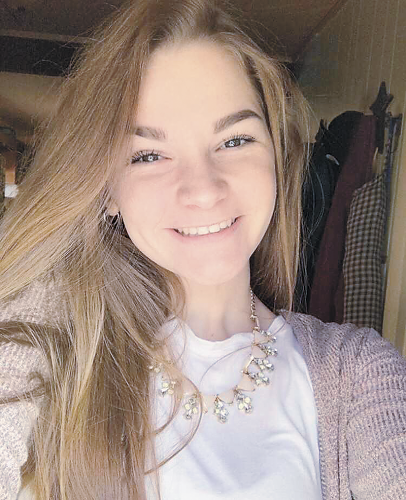 When my daughter Rachel found out she could portray a nurse in a field hospital and be part of the Boy Scouts, I knew I had to find out what all this would entail, so I signed the whole family up to be re-enactors in the 148th Regiment Field Hospital/Venture Crew. 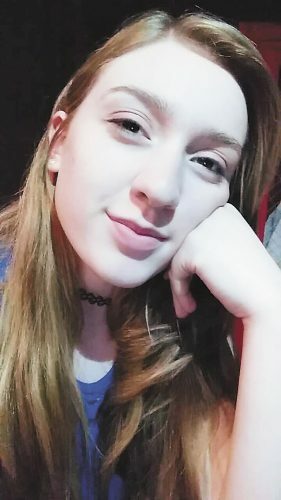 Now, you might think that is a bit much to make such a decision for my whole family, but my children are close in age and we did most things together, anyway. The only one who really objected was my son, Nate. So he showed it in true rebel style by deciding to be a Confederate soldier; which was OK, because a field hospital would have taken care of any wounded soldier, no matter for which side he was fighting. He pulled in a couple of friends and they rounded out our Confederate company. The spring of 2010 saw the 148th Venture Crew hold its first Sparks In The Park. My husband, Frank, was not totally on board with it yet, but he borrowed a uniform and went out on the battlefield to play. He came off the battlefield an enthusiastic re-enactor. It does seem an unusual family past time, I will say. However, I have discovered over the past nine years that a lot of families do this together. It is camping without all the extras. You learn how to cook macaroni and cheese over an open fire; how to set up old canvas tents; how to make do without electronics; how to work with others even when opinions clash; how to be flexible when the travel and set up plans go askew; what kinds of things they already had in 1861; and, of course, how to keep your things dry in the rain. Somerset resident Ralph Lincoln, center, portrays his ancestor, President Abraham Lincoln, delivering the Gettysburg Address while flanked by Union soldiers at Kish Park in 2013. Lincoln is slated to be a featured speaker again during 'Sparks in the Park' on May 6. I think my favorite part of re-enacting is spending time with the other members of the Venture Crew and Unit. Without the electronics, you can have a conversation that covers everything under the sun. You can learn about each other and help teach each other about not only the time period we portray, but also how all these lessons can apply to our daily life “as a civilian” in the 21st century. One of the most eye-opening things I learned about the Civil War is that the women of the day on both sides were just as involved in the war effort as the soldiers. The men were gone. The women had to keep the home business or farm going. They started “Aid Societies” to help the soldiers. When letters complaining about the food or the medical care started coming home, the women began a campaign of their own for the care of the soldiers. Thus, the first Sanitation Commission was formed. Some women even packed up and followed the army to take care of their men. That is who I portray. After all, I have two sons and a husband who are shooting at each other, with a daughter who is patching them up afterwards — a perfect example of what often happened to families as people chose sides. Most of our modern medical techniques came out of the Civil War. Ask the doctors about it at the next Sparks In The Park, which will be May 4 to 6, in the campground at Kish Park. This year’s Sparks is the Camp Curtin edition, and will be different from past years. Camp Curtin was the training camp for all the soldiers that came through Harrisburg at the beginning of the war. To that end, we are inviting the public to come train with us. The Shawnee District Boy Scouts and the Girl Scouts are also joining us to learn what it was like during the Civil War. We will still have our Student Day on May 4, when area schools can bring students through various stations to learn the different aspects of Civil War life. On May 5, the morning begins with the public able to “Muster In” as soldiers, nurses, orderlies or followers. After their training, at 1 p.m. they can participate in the battle and medical demonstration. Don’t forget to visit the North and South encampments. Re-enactors love to share what we have learned (and what most people don’t know or have forgotten) about the Civil War. Everyone is invited to join us for the Civil War Ball at 7 p.m. May 5 in the Green Pavilion. The Dance Master will teach us all the dances. 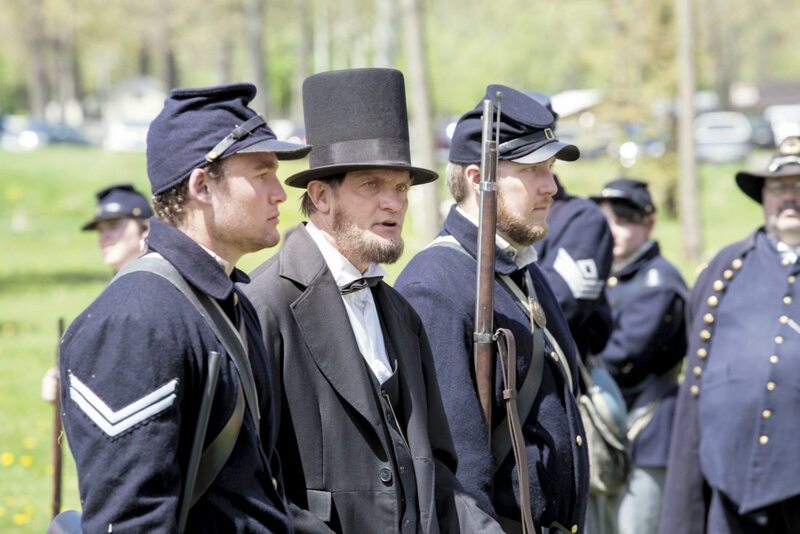 May 6 begins with a church service at 10 a.m., followed later by President Abraham Lincoln giving “The Speech that Never Was.” The weekend will end with a 1 p.m. skirmish and retiring of the colors at 3 p.m.
Re-enactors and area residents mingle during a Civil War-era ball dance at Kish Park in 2013. A similar dance is scheduled on May 5 as part of the 'Sparks in the Park' Civil War event.